"...... 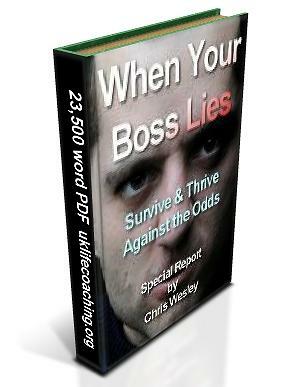 I also bought the bosses who lie ebook - it was excellent." "You're really inspiring - thank you for sharing your insights and examples, Chris!" "It's brilliant, it really helps me, and it also helps me to do my job better - Thank you so much"
"Great content - great subject matter - well written - very helpful…"
I will have to go back over it as there is so much advice I think applies to me it could take a while!" "Chris is really helpful and truly inspirational"
"You hit the nail on the head -- yet again! " "Now I know you understand and I don’t feel like such an emotional retard! Thanks very much for this!" "easy to read and inspirational..."
"Chris as far as I'm concerned you are doing a fantastic job! ... wise and give me such a super insight into things' that make me look at life in a different perspective! Keep up the good work! You're a GEM!" "This book provides short and insightful examples drawn from practice. Chris Wesley outlines the main principles and techniques of his approach, making clear illustrations of the challenges which arise when changing attitudes, and the positive outcomes of developmental change." "... or when they're rude, manipulative, weak, hateful, unfair or incompetent"
Is this your boss one of those? So, your boss lies - or they're difficult to deal with. How do you handle that? Perhaps he or she is lying to you, or lying to others about you, or both. Perhaps they're manipulative, weak, hateful, unfair, or incompetent or a bad boss in other ways. You are in a difficult situation. You need the job and the money and your boss threatens both. So how can you steer this stressful and difficult situation to a good outcome? I've seen many clients in this situation over the years. Whilst the path we choose depends on their specific circumstances, I see several very common scenarios. Your boss is manipulative, weak, incompetent, dishonest, unfair. People tell lies because lies are a fast, cheap shortcut to a goal. Most of us lie or exaggerate in trivial ways - to make a story more interesting or to gain sympathy from a friend, and the consequences are generally harmless. But when bosses lie, the stakes can be very high. Daily misery, low morale, stress, absenteeism, illness, redundancy and poverty can all result. I qualified with a double distinction in life coaching from Europe's largest training body in 2004. I've been coaching people to be more successful at work since then. My clients become better at what they do, they do more of what they like (and less of what they hate), they get promoted, earn more, and become happier, And in the course of that work, I hear some amazing things about life out there in the working world. Before that, I lived and worked out there in corporate land. Seventeen years in large companies and five years lecturing in local college. So I'm not some academic who's never lived in the real world. I have long, practical experience as an employee and a very successful manager. Then my coaching practice gave me a much broader understanding of what my many clients have faced at work. This combination of experiences allowed me to develop the insights and techniques which work, in this difficult area. You don't have to hire me to benefit from these powerful techniques. I've put them into a book of secrets in downloadable PDF format. Now you can learn them and use them to get justice in your workplace. You may even come to love Monday mornings! It's 23,500 words of highly practical techniques for you to start using today. This is a very practical, easy-reading book. It's full of anecdotes from my casebook and practical illustrations of the techniques in use. The techniques can be used to get you out of a lying boss situation and also to protect you from it happening in future. Cultural Manipulation looks at how poor ethical standards and a buyers market have led us to expect unfair treatment at work. It's so common we don't notice it. After reading this chapter you will notice it, and you'll know how to protect yourself against it. Why Is Your Boss Lying? What do your boss's lies tell you about them? When you understand their drivers you can use those very drivers to leverage a better outcome for you. Assertiveness How can you defend yourself against your boss's lies without attracting their anger? How can you stay calm in the stressful times without retreating? This chapter explains the techniques which get you heard, hold your boss to account, and keep you safe from their emotional outbursts or vengeful action. Goal Alignment is the key to motivating your lying boss to clean up their act. I'll show you how. Networking is your force multiplier. Mobilizing others in a variety of ways can change the power dynamics at work enormously in your favour, without being seen as a militant trouble-maker. Making Change Happen is all about making you strong enough to use these tools effectively. We look at your fears, your self-image, your energy levels, and your attitude to "failure". The new ideas you'll find here can transform your outlook on - and your performance in - your life. The Casebook is devoted entirely to real-world examples of the ugly messes we find ourselves in at work, and how to use these techniques to put things right. This book is a great read and when you've read it you'll be ready to take control of your life at work enjoy what comes next. You came here because your boss is giving you a problem. Do you want to keep living with things the way they are? Do you have another plan? You can be relaxed and enjoying your at work again. This book is your solution. Anyone can use these simple techniques, yet they are very effective. There's no need to argue, confront, or take risks. You can stay true to yourself yet get radical change. I spent 17 years in the corporate world, and I've coached thousands of people over more than a decade. I know my stuff - and it's in this book. Let's Fix Your Boss Today!